The Congress party on Friday came up with an audio clip alleging that BJP leader Janardhan Reddy tried to buy one of its MLAs. 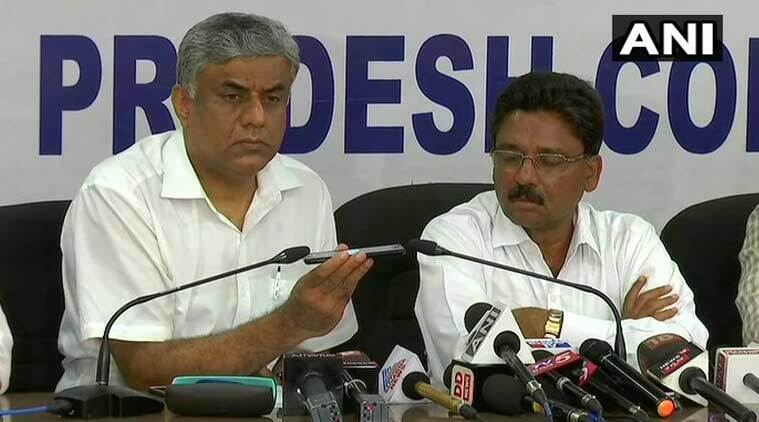 Karnataka: Congress releases audio clip in which Janaradhana Reddy is allegedly trying to lure Congress MLA from Raichur Rural by offering him money. The Congress party on Friday came up with an audio clip alleging that BJP leader Janardhan Reddy tried to buy one of its MLAs ahead of the floor test tomorrow. The party has claimed that Reddy tried to lure Congress MLA from Raichur Rural Basanagouda for joining BJP. In the audio, a man suspected to be Reddy is heard telling the Congress MLA that he should favour the BJP in the floor test and in return he can be made a minister. Here is the audio of the sensational tape thrown in the ring by the grand old party even as the BJP prepares to take the floor test in Karnataka assembly tomorrow. “Tell us what position you want, we can speak one to one and go ahead… But today, you’ll become a minister. I assure you that I will make you sit with big people one on one. They will keep their word. They are ruling the country. Whatever assets you have made you can make hundred times more,” the man can be heard saying in Kannada. The authenticity of the audio clip is yet to be verified. Reddy: Is it Basanagouda? Are you free? Daddal: Yes it is me. JR: Forget all that has happened before, forget all the bad things. I am telling you, that my good time has begun. And I will arrange a meeting with the national president and you can speak to him one-to-one and we can take the enxt step. BD: No sir, when I was on my last leg they made me MLA. JR: I will tell you one thing. BSR time we had very bad time when we formed the party, where there was a lot of opposition. There is no doubting that you have lost a lot by believing in us. But I am telling you, you will grow a 100 times more. Shivanagouda nayak became a minister because of me. Today he is strong and able to look after himself. It all happened because of me. Raju Gowda also benefitted because of me. JR: It was your misfortune that it was our bad time. Today Shivanagouda winning is not useful. You will become minister. Did you understand? Directly we will make you meet the big man. I will make you speak to him..(audio break). you will make 100 times the wealth you made so far. Karnataka Governor Vajubhai Vala on Friday appointed BJP MLA KG Bopaiah as pro-tem Speaker ahead of floor test in the state assembly tomorrow. The Supreme Court has asked chief minister B S Yedyurappa to prove his majority on the floor of the Karnataka assembly at 4 pm Saturday.